These pancakes are great for a weekend brunch, they are really easy to make and can be combined with loads of different flavours. 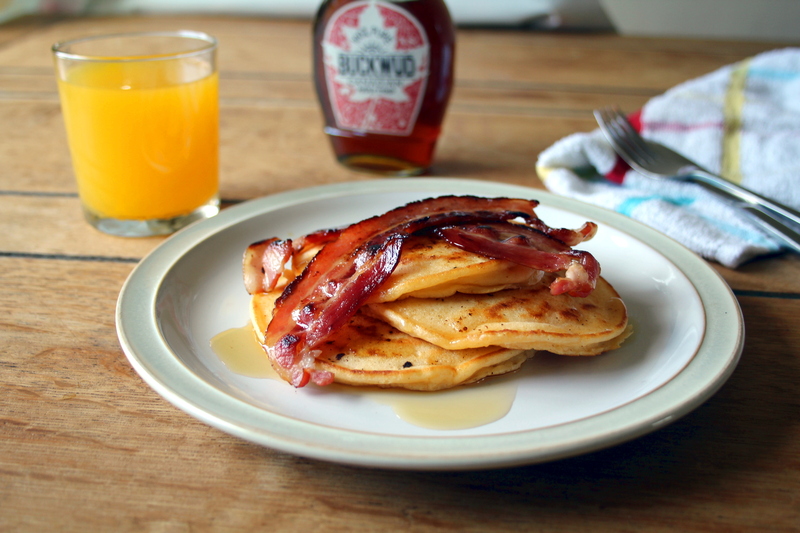 I’ve chosen some classic American flavours – light and fluffy with sweet syrup and salty bacon. Put the flour, baking powder, egg and milk in a bowl and mix until smooth and lump free. Set aside whilst you cook the bacon. Cook the streaky bacon in a large frying pan over a medium heat until crispy and golden brown. When cooked take the bacon out of the pan and set aside. Pour out most of the oil out of the pan and drop two tablespoons of pancake batter (1 per pancake) into the frying pan. Cook for about 2-3 minutes on each side until golden brown. Place on a warm plate and cover whilst you cook the rest of the pancakes. Split the pancakes between two plates and top each stack with two rashers of bacon. Pour over the maple syrup and enjoy!